Here we are! Day one! 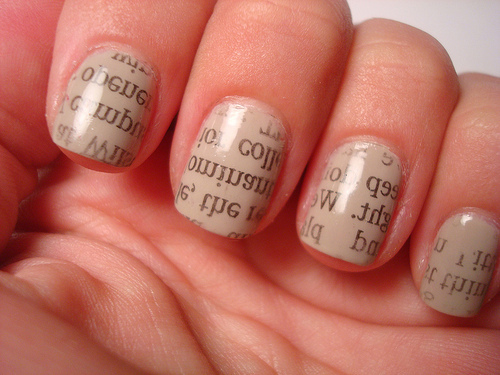 For my first pin of the week I decided to try out these newsprint nails. Here's how you do it if you want to try! Step one: Paint your nails in a coat or two of your color of choice. I went with Sally Hanson's Insta-Dri Blue-Away. Step 2: Get your rubbing alcohol and small pieces of newspaper. I don't know about you but I read the paper first so I knew what I was using. I wasn't too keen on having an obituary on my nails. When I did this I used moderate pressure and held it for several seconds. It was hard to gauge how long to leave the newspaper on though. On some nails hardly any ink transferred and on other nails the paper itself tore off on my nail. On the light nails I redid the alcohol/newspaper process and it looked better the second time around. On the nails where the paper stuck a clear topcoat helped make it translucent. I used a clear coat on all the nails and I think it looked good that way. Be careful when you do that though because if you run the brush over the print more than once, it will start to smear. None of them turned out as well as the original picture. Maybe because I used a darker polish? Or a lighter newspaper? I'm not sure. I think this would look kinda cool if you used white polish and transferred the comics. How cute would a little snoopy be!? Here's the skinny on this: It was pretty easy to do in spite of my few mistakes. People definitely noticed my nails (yay! :-) ) and I like the way it looks too. Would I do it a lot? No, but I'll probably do it again. If you didn't get to it today, that's cool, it is Monday after all. That is the coolest!!! You did an awesome job! I'm super impressed that this was posted at 6:15 am. I wonder how it would look with music--do you think it would work? Gonna have to try it. Marilyn, that's what scheduling posts is all about :) not to say I wasn't up at 6:15, gotta love that early risin' child of mine. Jillian, I need to check that link out, thanks! Mom, music! Of course! I am definitely going to try that. I love your blog Mari!! you are so funny...and I love, love your pinterest week! What!? How come I didn't notice your nails - I mean I noticed they were blue and I was gonna say something cause I really liked the color, but I didn't notice letters. I need to see them closer now!! Very cool - I wonder if I could do my toenails.